Is it correct that the cancel does not show a date ? Is it a real cancel or a kind of overprinted cancellation ? Indeed, this is clearly a CTO. Dahomey issues for the International Year of the Quiet Sun in 1964. The "Quiet Sun" refers to the Sun's sunspot cycle, during which the number of observable sunspots on the Sun's surface waxes and wanes. The sunspot minimum is the so-called "quiet" period. The sunspot cycle has a basic period of 11 years, with a secondary modulation at 22 years period, and some further ones in the century range. Its full complexity is still not completely understood. Although individual sunspot formation is understood as a bunching of magnetic field lines crossing the Sun's surface and locally decreasing the temperature (making the area appear darker), uncovering the complete dynamics of the Sun's magnetic field (how it is generated, how field lines reconnect to change its shape and strength, and the true nature of the link to temperature) is still very much an area of open research in astrophysics. I do not know when this series was done but we are talking here of the 60s and I was young at the time lol lol !! 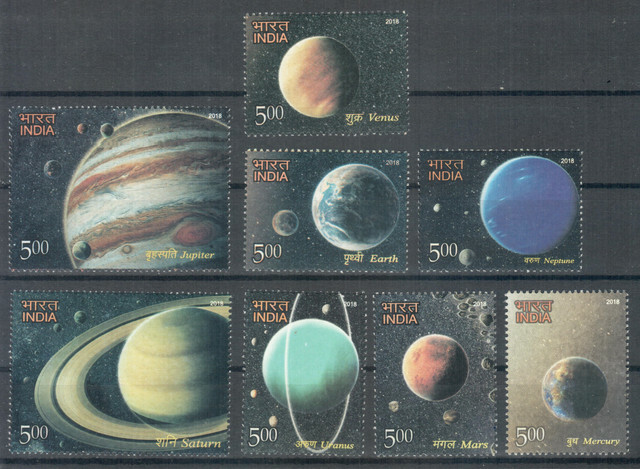 All Countries had their space stamps (either Russian or American) which ends up into specialized collections. Yes !! Thanks for showing, Xavier !! Two Apollo VIII themed FDCs from Guinea I received yesterday. The stamps featured actually are listed neither by YT nor by Scott, so I'm not sure they're really legit (the listed issues have the Apollo VIII mission overprint on different stamps from the same series), but they were cheap enough I don't mind too much. Two satellite stamps from Andorre, issued in 1962 and 1966. The 1962 issue is actually the first French Andorra commemorative.